Flu shots weren’t for me, I thought. Why would I want to be injected with the inactive viris, at the risk of getting flu symptoms now, to guard against the uncertainty of getting it down the road. Then there’s thimerosal, the ominous mercury preservative still apparently used in the vaccine. But then I had the flu bad last winter in Baltimore. We’re talking a 103-degree fever that made my brain swell and throb, a fever that hurt so bad it made me cry. I had to practically crawl to the parking lot after the flu hit me at work. My whole body ached when I coughed. Still, I wanted to embrace the natural, echinacea-can-keep-me-healthy Oregon lifestyle. I was just going to tough it out this year. But then we heard the flu hits really hard here, particularly in a university town that students, scholars and athletes from around the country and across the globe pass through. Plus, with our health insurance, the $15 shots were free through the Oregon State health center. Now there’s a slight tingling down my left side where I had the shot and my toes feel achy. My throat is a bit scratchy. Are these symptoms psychosomatic or real? I just better not come down with full-fledged influenza this year. Did ya’ll get flu shots this year? Do you think the benefits outweigh the risks? You certainly don’t here about the shortage of flu shots like we had in 2004, now that more drug makers have flooded the market. I got a flu shot and have for the past few years. i used to be convinced it made me sick once when i got the flu 2 weeks after getting the shot. but now i realize that’s probably not the case. i haven’t gotten the flu at all the years i have gotten the shot and even opted to get one while pregnant. hope it works for you! Yeah I’m still feeling achy and off today but hopefully it will prevent worse symptoms down the road. This is a total experiment. I’m my own control group. But I still feel funny about having flu injected into me. I’ve taken flu shots every year since I had a bad case of flu and never had any symptoms from the shot. Of course, the school systems offer them for free — they don’t want you to be absent for all those days it takes to recover, and they sure don’t want you spreading flu around the school buildings. Those places are already little incubators for all kinds of germs! Man yeah there’s nothing like getting a bad place for the flu to convince you to get one. I think universities are germ incubators, too, so Dan would probably be bringing home a lot of nasty stuff, especially with 250 students in one classroom! yikes! did you need to put that at the header of your post? what the photo or the post headline? Squeamish? 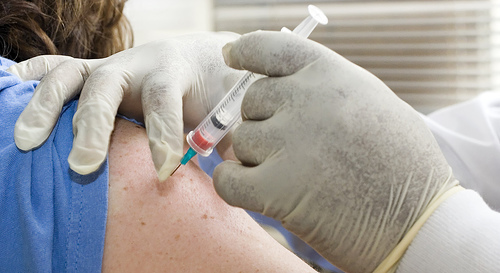 Have you ever had a flu shot?